Stayed there with a group of friends and we all thoroughly enjoyed it! Rooms were nicely decorated, beds were comfortable and amenities were perfect for a BnB! Great service, and customer interaction to boot! Right on Canal Street so hopping a trolley to the party zone is a piece of cake! The Canal Street Inn is a phenomenal, elegant, and affordable B&B in the Mid-City district of NOLA. The location is about a 15 min street car ride from the French Quarter, and within walking distance of several fine restaurants in the immediate area. The inn itself is 19th century style, with many antique furnishings mixed with modern conveniences. The staff was extraordinarily helpful and hospitable. The homestyle breakfasts were delicious. I have nothing but positive things to say about my stay and would happily do so again when I have the opportunity. Me and 14 of my closest girlfriends decided to celebrate my Bachelorette Weekend in New Orleans and we are so glad we did! Staying at the Canal Street Inn, far exceeded our expectations! To accommodate all 15 of us we rented the entire house which was more than enough space. There was 10 Bedrooms, that were all really spacious and clean. I loved how the first 2 floors were more historic and antique like and then the basement was lively and modern. It was the perfect mix for our crew. Because Canal Street Inn is an actual Bed and Breakfast, every morning we were able to set a time to be served breakfast (Included in the Rental Fee..Yay) and all sit-down and eat together as a group. Michael and Rosa were our Inn-Keepers for the weekend and they were FANTASTIC and very attentive. This house and service really made our trip Special! Will definitely be booking here my next trip to New Orleans! This was our first time in NOLA. Mike and Rosa were the best hosts. Rosa greeted us to the beautiful Inn with a warm smile. They both gave us perfect suggestions for entertainment and dinning. Our room was clean and cozy. The trolley out front is a great bounus. Our care never moved from the psrking space in the back. Thank you Canal Street Inn for a great visit to your lovely city. Love the rooms and the tubs are amazing , the patio is beautiful. Their hospitality is over the top . The beautiful dinning area where they serve breakfast is also amazing just all over amazing. !!!!!!! We wanted something charming and different for our girl's trip. The Canal Street Inn did not disappoint! The staff was friendly and helpful, and breakfast was delicious. We would definitely stay there again! Clean, comfortable with a great breakfast. Innkeeper pleasant and very helpful. The location couldn't be better, street cars stopped directly across from the front door so easy to get downtown and to the French quarter. Beautiful decor, friendly and accommodating staff. Fabulous Breakfast . Close to downtown. Would definitely stay here again. We were a group of 28 women and we had the whole house to ourselves. The owner arranged for a wonderful masseuse to set up in the lower area . 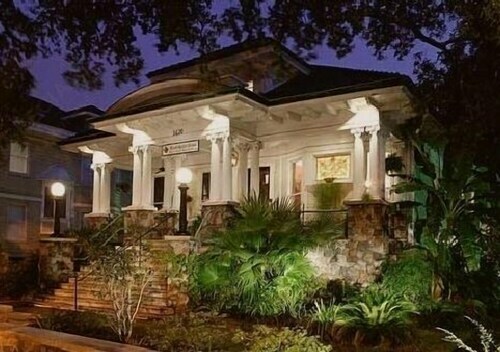 Located in Mid-City, Canal Street Inn Bed and Breakfast is within 2 miles (3 km) of popular attractions such as Canal Street and New Orleans Museum of Art. This 10-room, 3-star bed & breakfast welcomes guests with free breakfast, free in-room WiFi, and free self parking. Free continental breakfast is included with your stay and awaits you each morning from 8 AM to 10 AM. Guests can expect to find free WiFi and 32-inch a TV with cable channels. Beds sport Egyptian cotton sheets and the bathroom offers a hair dryer and free toiletries. Other standard amenities include a balcony or patio, a computer, and free long-distance calls. Guests of Canal Street Inn Bed and Breakfast enjoy features like a fitness center, free WiFi in public areas, and a computer station. If you decide to drive, there's free parking. A multilingual staff is on hand to assist with luggage storage and concierge services. Additional amenities include a free grocery shopping service, a library, and express check-out. Free continental breakfast is served daily from 8 AM to 10 AM. Recreation features at Canal Street Inn Bed and Breakfast include a fitness center. The preferred airport is New Orleans, LA (MSY-Louis Armstrong New Orleans Intl. ): 20-min drive, 13.4 mi/21.5 km.